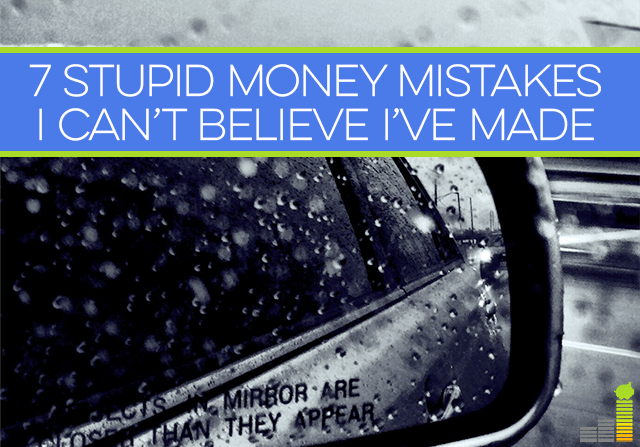 Stupid money mistakes – we’ve all made them. Some of them are nothing more than a momentary blip. Then there are the doozies that make you want to go back and smack yourself silly. Fortunately (or unfortunately depending on how you look at it) I’ve made plenty of dumb money mistakes over my 40 years here on earth that have provided ample lessons for me to learn from. Why do I share some of my money mistakes? Well, for two reasons really. First, to show that all of us are fallible. No one is perfect and we all have or had room to grow in certain areas – myself definitely included. Second, and somewhat more importantly, is to show why I care so much about financial literacy. My parents didn’t do much in terms of teaching me about money. That’s not to deflect my responsibility for the stupid things I’ve done but as a means to help give the little Frugal Rules’ a solid foundation so as to make wise decisions with their money as they grow older and start out lives for themselves. So, if you’re wanting some dirt on me then today’s the day as I peel back the curtain on some of the most boneheaded money mistakes I’ve made over the years. No down payment on our house. This is likely the most recent money mistake I’ve made. We still live in the first house we bought a little over eight years ago at the height of the real estate craze. Our first child was on the way and I rationalized to myself that we had to be in a house. Boy, do I wish I could go back and knock some sense into myself! Thankfully Omaha was sheltered from most of the downturn, but that aside it was a stupid decision. Suffice it to say for our next house it’ll be at least 20 percent down, if not more. Putting Vegas on credit cards…Twice! No, we’re not talking about to earn some sweet points, but to rack up debt! After Mrs. Frugal Rules and I got engaged I moved out to San Diego and lived there for roughly two years. In giving license to my spontaneous side we went to Vegas twice and put it all on plastic. We didn’t gamble much…in Vegas that is, as the gambling was in financing the trips for a number of months on our credit cards. Buying DVDs. I know this one might be a bit debatable as who knew the direction technology would go long-term, but we have far more DVDs in our entertainment room than I care to think about. Sadly, we could watch likely 90+ percent of them on Netflix or Amazon Prime today. CDs. No, I don’t mean the interest bearing kind. I know it ages me a bit here, but I spent major bank on music back in college. It would be nothing for me to walk into the music store and plunk down my card for at least 8-10 CDs at a time and several times a week at the height. Not really surprisingly, this made up a good part of the credit card debt I rang up while I was in college. Cashing out my 401(k) because I “needed” a computer. This one was a real doozy! It was one of my first jobs out of college and I left for another job. I had built up several thousand dollars in my 401(k) which I had been told I could and should rollover into another retirement account. But, I also told myself I needed a new computer and saw the 401(k) as found money. So, I cashed that puppy out (not realizing the absolute ridiculous mistake I was making or even seeing that the taxes alone would’ve gotten me halfway to the computer). I have no clue what I spent the rest of the money on. Yeah, I know, I’d smack my younger self too. Buying a ridiculously massive truck because it looked cool. This happened soon after Mrs. Frugal Rules and I moved to Omaha 13 years ago. Her trusty Corolla died at just under 200,000 miles. Instead of putting in the money needed to try and repair it we went to the closest dealership and bought a fire engine red extended bed truck because it looked cool. This is the stupidest money mistake I’ve made. Why? I HATE the color red, I’m NOT a truck person and it came with a car payment of over $350. It was stupid all the way around! Having season tickets while paying off debt. I’ve written before of my love of K-State football. Mrs. Frugal Rules and I used to have season tickets, and do now with my younger brother, though in the former instance we were still paying off my student loan debt. I don’t believe you need to give up everything in life when you’re paying off debt but this would’ve easily given us at least an additional $1,000 a year to pay towards my debt. While I did enjoy having them I’d rather have had the debt freedom, that much sooner. Ok, there you have some of my most stupid money mistakes. I’m not proud of them, but you live and learn – right? At the very least, it provides a foundation of have real life lessons to draw on when we are teaching our kids about money. What are some other stupid money mistakes to avoid? What money mistakes have you been guilty of? What triggers you to make foolish financial decisions? I’ve still got a tower in the basement with over 400 CD’s inside. Luckily most of them were “free” back when there was that whole “12 CD’s for the price of 1” thing with BMG. But even still – that was a lot of money to tie up in plastic discs that are essentially worthless now. Now with Pandora and Internet Radio I haven’t downloaded or purchased anything in years. On a similar note: My son is quickly finding out that video games are the same way in terms of not holding their value. Games that cost us $50 a few years ago now trade for less than $1 at GameStop. Ha ha, I remember BMG – I bought way too many through them as well. I’d imagine that’d be the case. Looking back, I regret that I bought dvds. I have so many here that I can call like a collection of DVDs and VCDs. I spent so much money like thousands of dollars! 🙁 I wish there was free download back then. I used to go places like “bed, bath, & beyond” and shop to kill time. TERRIBLE idea. Yep, I did the same thing – not Bed, Bath & Beyond but retail therapy all the same. Vegas on credit card is pretty bad =) I can’t really talk though, I’ve certainly made my share of mistakes! Like you It is my mission in life to guide my kids to make better decisions than I did. My parents believed that talking about money with us kids would make us worry and childhood should not be full of financial worry. We will find a middle ground for our kids. We did the same thing Rebecca – it was about 5 years for us. Thankfully we’re back on track but you can never get those years back. That middle ground is huge and definitely possible! “What triggers you to make foolish financial decisions?” I’d say emotion mostly. 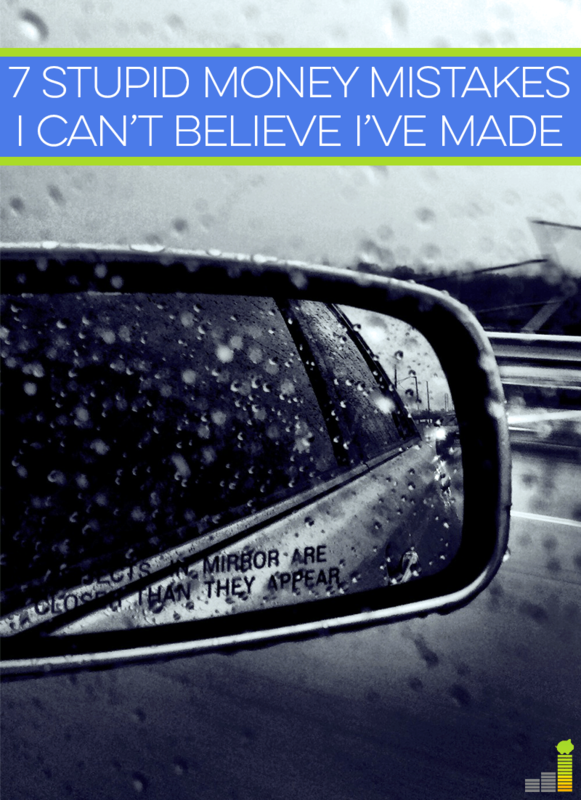 Most of the mistakes I’ve made were based in some emotional state I couldn’t/didn’t control at the time. Whether it’s being sad, depressed or too excited we rarely make good financial decisions when we are emotional. Could not agree more Brian! Appreciate the transparency, John! I feel like there is a lot of pressure on bloggers to act like they do no wrong (especially with PF bloggers), so it’s nice to see someone share their mistakes. We definitely did not put enough of a down payment on our first home. I also would say another mistake of mine is underestimating my time/capacity to do home projects. It’s really tough to find the extra time to research and execute home projects, and I know it will cost us more than we expected to have certain projects completed by professionals instead of going the DIY route. I agree DC, there is some pressure towards that end and God knows I’ve made my share of mistakes. Not to mention that I probably still do some things that would make some PF bloggers rebuff. I’ve been guilty of that one myself too. But it paid off because it’s given me good blogging material. Oh and I financed it of course! Buying a house with the mortgage almost half of my salary! Yep, we all make mistakes. Ha! I love this John! We all make stupid money mistakes, but thankfully most of them can be corrected. For me, I cashed out some of my IRA (more than the 10% allowance) to help fund the down payment on our home. Not only did I do that, but I didn’t reserve enough in taxes when I did, so when April came around, I also had a hefty tax bill. It was a double whammy and one that I will never forget but also never repeat again. At least you have or had something of value to show for it. 😉 But, that double whammy can definitely prove to be a memorable lesson. ha I just got rid of the last of my CD’s this past summer. Good riddance. I LOVED them in my 20’s but I wish someone could have come from the future to tell me about all the ways you can now listen to music for free or just download individual songs. 🙂 I bought two new cars in my past with higher interest rates and I think one was a 7-year loan. Good lord! I think I did pay it off early though. ugh! I know, I wish the same thing. 🙂 It’s crazy how much music I bought! Wow…you’re not the only one who has done something like that though. It wasn’t Cancun for me, but a trip all the same. Well, it’s refreshing to know that we all do stupid things with our money! My stupidest mistake was using my credit cards to pay for travelling when I was younger- I’m talking cards that charge you 40% interest. And of course, I didn’t clear them off very quickly. Oh yeah, and also buying a car unseen, because I needed one (can’t live without a car apparently….) even though I could easily have waited and got a better deal. I sold that car less than a year later for £2000 less than I bought it for. Lesson learned. Anyway, I’d love to think that I’m a bit less stupid now, but only time will tell! I loved retail therapy myself as well. Everybody makes money mistakes. You are definitely not alone. I decided not to get season tickets for K-State’s home games that last couple of years because I knew I couldn’t afford them and all the travelling to get there for every game. But I still would’ve like to have had them! Yea, I love going to K-State games but, looking back, I would’ve rather had the freedom sooner. I’ve made the mistake of paying for trips with credit before. I will never do that again. I think buying DVD’s is debatable. As long as you purchased them in the $5 Walmart bin you’re fine. Ha ha, no very few of them were of that variety. We’re talking at least $15-20 per movie. I think all of us of a certain age invested a lot of money in CDs and DVDs and maybe some of us of a certain age even invested money in tape cassettes and walkmans. 🙂 I don’t like making money mistakes but always try to learn from them too. Yikes. I was on/trying to get one disability for a good chunk of my 20s, so there aren’t a lot of big purchases to regret. I went to a friend’s wedding and, since we were splitting a hotel room, got almost no sleep. I didn’t know at the time that I was bipolar and apparently cycling manic. So I went to look for a ring for my own upcoming wedding. And also walked out with a necklace and earrings. Not cheap. That and we got an expensive set of pots that promised to make cooking easier. We still don’t cook. Sigh. Yea, unfortunately you’re not alone with regards to things you bought but never used. We didn’t put any money down on our house either. We bought it four years ago when the market was at rock bottom in our area. We purchased it for a FRACTION of what it was originally purchased at & received an $8,000 first time home buyers refund from the government (which at that time was only being given to military buyers). Our house has since doubled in value what we paid for it. Its still nowhere near what it was originally worth, but since we will make a profit (if/when) we sell, we’re happy. It sounds like it didn’t work out too bad for you in the end, especially with sitting at a profit right now. It amazes me that you’re allowed to buy a house in US with no downpayment (min 5% in canada). I’ve done my fair share of dumb things too…like put thousands of dollars in tuition on credit cards but at the time I was stuck with no other optiions (Though in hindsight TOTALLY could have managed my summer job money better to pay for more school). There are no mistakes in life- just learning opportunities. It does me as well Catherine. It used to be that way, but they eased it significantly over the past few decades. My biggest mistake would be buying a motorcycle right after getting my first job. Seemed like a great idea at the time but it quickly turned into a money pit. Fun for a while, but soon the fun just couldn’t justify the monthly bills. Ended up selling it just over a year later. At least you were able to get out of it relatively quickly. Hopefully it wasn’t at too high of a loss. Oh, the no down payment is on my list as well. While we are in our second house now and put down 20%, I didn’t think much about it when we did it on our first house. They were giving money away then and a no down payment was just too easy. Unfortunately, it cost me too much money! Yep, same here sir. We’re planning on at least 20% for the next one and a 15 year mortgage as well. I don’t want to learn another expensive lesson where real estate is concerned. That new car hurt my pocketbook for $500 a month for 5 years. Won’t be doing that again. Yep, no car payment for us again either. I think we all can look back and realize that we’ve made some stupid financial mistakes. Probably my worst mistake was when I was a young man and I invested $10k in my former-brother-in-law’s company. Since I knew him, I didn’t ask too many questions or do much fact-checking. When I didn’t hear any updates and couldn’t reach him by phone, I went to his office, only to find it no longer existed. The next time I saw him was on the evening news, in handcuffs for investment fraud. It was only a slight comfort that I was one of hundreds who had given him their hard-earned money. But mistakes are how we learn, and you can be very sure that I never invested so blindly again. Wow, sorry to hear that Gary! I guess it just goes to show you that you can never know about some people.